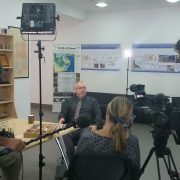 HALBAN A TV team from the German-French channel ‘arte’ has visited GUtech today morning. 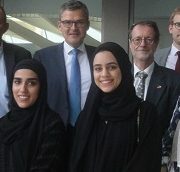 The journalists spoke with Prof. Dr. Wilfried Bauer, Head of the Department of Applied Geosciences (AGEO) about the study-programme that was designed in cooperation with GUtech’s German partner-university RWTH Aachen University, highlighting the important role of geology in Oman. The TV team also attended a geological mapping class. They then interviewed female AGEO students about their studies and their future job aspirations in a male-dominated professional field. As an essential part of their studies AGEO students have to conduct internships and participate in regular excursions, e.g. to Germany. The TV team is on a one week visit to the Sultanate where they visit different locations. 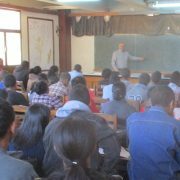 HALBAN Professor Dr. Wilfried Bauer, Head of the Department of Applied Geosciences (AGEO) at GUtech, has recently conducted a scientific workshop on mineral resources and their exploration at the University of Antananarivo/Madagascar. On a global scale, Madagascar is an important producer of nickel, cobalt, ilmenite, and zircon. “The country has significant resources of flaky graphite, chromite, bauxite, Rare Earth minerals, iron ore and the largest known reserves of sapphire. Historically, gold and mica played also an important role but both commodities are currently exploited by artisanal miners only. Minerals account for approximately 35 % of the country’s exports of 2.2 billion USD (2014 data), most of it from a world class nickel-cobalt deposit. International mining companies like Rio Tinto and Sherritt invested in the development of the mineral sector,” said Prof. Bauer. With an increasing number of international exploration companies operating in the country, the need for mineral exploration courses cannot be covered by the existing university staff. “After having given a course about basic exploration techniques, I decided to offer an exploration geochemistry workshop for the specific needs of Madagascar, based on known types of mineral resources and the specific constraints due to tropical weathering and topography in Madagascar.” He said while explaining that he has a long-lasting relationship with the Science Faculty at the University of Antananarivo that dates back to 2005 when the Department of Geosciences supported him in as leader of a BGS-USGS mapping campaign with 10 student interns. Since that time, we upheld our connections,” said Prof. Bauer. The workshop was very successful, despite the fact that English plays a minor role in Madagascar and the normal education language is French. A similar follow-up workshop is planned to be held next year. This summer, Prof. Bauer also supervised the start of a joint PhD project, between GUtech and the University in Northern Madagascar. The researchers started a petrological study in the North of Madagascar. Research samples are handled and processed at GUtech’s AGEO lab and the analyses are carried out at Lisboa University in Portugal. HALBAN The Orientation Days for new students and academic staff were held on campus today morning. Dr. Hussain Al Salmi, Deputy-Rector for Administration and Finances welcomed a large number of Foundation Year students. Foundation Year students will study Academic English, Mathematics and IT throughout one year before they move on to one of the BSc or BEng programmes. “We want to educate you to the best possible. We will teach you but you will be responsible for your education,” said Prof. Dr. Armin Eberlein, Vice-Rector for Academic Affairs at GUtech while adding that the next years will fly by, and the student will still remember this first day at the university. During the induction for students the International Office introduced their services. 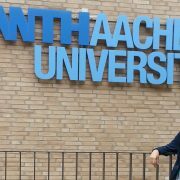 Aysha Farooq, a GUtech alumni who works at the International Office mentioned that the German language is very important for the students and will help them to persue their studies in Germany including at RWTH Aachen University. The Department of Student Affairs highlighted their services to the students, such as non-academic counselling, clubs and associations, career guidance, social events and accomodation services. In addition, the Department of Registration and Student Affairs introduced the student portal with all its services. “The secret in education lies in respecting the students,” said Fouzia Williams, English lecturer at GUtech during an academic introduction for new teaching staff, which was held on the side-lines of the student orientation days. Wajd Al Mantheri is one of the new students, she will study International Business and Service Management (IBSM) at GUtech. Wajd went to high school in Kuala Lumpur, where she also studied Management and Business for one year. “At that time I felt that I like business, it is my major. I have selected GUtech because of the International Business programme. I hope to achieve a high GPA. I really want to develop myself, especially in communications. I wish to discover new things and develop tourism in Oman in future, for example cable cars in mountain areas,” she said. 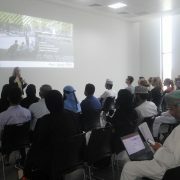 A number of international students and graduates from RWTH Aachen University started their internships or studies at GUtech today morning. Among them is Mariana, an IAESTE exchange student from Mexico, where she has been studying Petroleum Engineering. Mariana will conduct a six months internship in the Department of Process Engineering at GUtech. HALBAN To learn more about higher education, a delegation of representatives from the African Leadership Academy (ALA) including one of its founding members, Chris Bradford, visited GUtech along with a Conservative Member of the European Parliament for Yorkshire and the Humber, Amjad Bashir, last week. The Rector of GUtech, Prof. Dr.-Ing. Michael Modigell welcomed, the delegation and provided an overview of the history of the institution before they discussed potential for cooperation. ALA is a residential, secondary institution located in the outskirts of Johannesburg, South Africa. The academy is dedicated to high school students, between 16 to 19 years from South Africa and the rest of the world, with alumni from 45 countries. HALBAN Improving collective efforts within a team can lead institutions to higher performances of their staff members and an overall better customer service. With a workshop on teamwork, the annual Professional Development Days (PDD) for all GUtech staff members continued on Tuesday. “Team work is not an individual activity. Successful teams fuel the accomplishment of strategic goals. When we work together we can achieve much more than individually. It’ s like a football game,” said Thomas Hellebrandt from the Laboratory for Machine Tools and Production Engineering (WZL) at RWTH Aachen University while adding that it is important to have a team leader, to coach or guide through the entire team work. “A chairman controls the team moves according to the team’s objectives and develops ways to work together.” Thomas Hellebrandt and his colleague Tobias Adam have been leading the two-day workshop for GUtech staff members. Norms and guidelines should be established for the entire team building process. “Presenting problems in a way that promotes mutual discussions and a problem solving as well as trust in each other and being open-minded in other opinions are essential tools for successful working teams,” said Tobias Adam. In each team there are different roles that can change within the process, such as the information giver, the information seeker, the initiator, the opinion giver, the elaborator, the clarifier, the consensus seeker and the standard setter. Depending on the involvement and effectiveness of a team there are different concepts used such ‘the high performance team’, ‘the work group’, ‘the pseudo team’ or ‘the potential team’. The major goals of different team building activities were getting to know each other, improving the communication flow, using synergies between team members and increasing the motivation. “With the accomplishment of a successful project, the joint team efforts should be celebrated,” said Tobias Adam. Today’s team-building workshop will be followed by a research management workshop for the academia to be held tomorrow at GUtech. 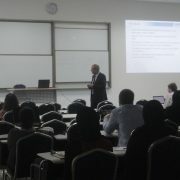 A presentation on improving research performances was conducted by Elsevier yesterday. Elsevier is a global leader for science and business information analytics, based in the Netherlands. Elsevier publishes a large share of scientific articles worldwide with a high impact factor. Their so-called ‘Scopus’ database facilitates the search for authors of academic papers and their affiliations as well as finding the right journal for publishing the scientific research. The main aim of the week-long workshops is also to welcome new academic and administrative staff members at GUtech and to enhance the overall research and teaching environment at the university. The annual Professional Development Days (PDD) were launched at GUtech yesterday. The main aim is to welcome new academic and administrative staff members at GUtech and to improve the overall research and teaching environment. The one-week programme includes presentations by the Rectorate on new activities and strategic approaches to research including research funding as well as an introduction to a new student information system, workshops on teamwork, research project management and intercultural communication. On Tuesday a presentation on improving research performances was given by Elsevier, a global leader for science and business information analytics, based in the Netherlands. Elsevier publishes a large share of articles worldwide with a high impact factor. Their Scopus database facilitates the search for authors, scientific papers and affiliations as well as finding the right journal for publishing scientific research. Several workshops of the PDD are held in cooperation with the Mechanical Engineering Department of GUtech’s partner-university in Germany, RWTH Aachen University. 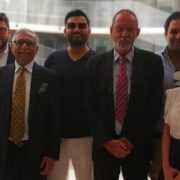 HALBAN A member of the German Parliament (Bundestag), MP, Mr Roderich Kiesewetter from the Christian Democratic Party (CDU) visited the German University of Technology (GUtech) last week. The delegation who was on a two day visit to the Sultanate was accompanied by H.E. Thomas Schneider, the Ambassador of the Federal Republic of Germany in Oman. Mr Kiesewetter is a representative of foreign affairs for the CDU/CSU-Caucus. He has been a member of the German Bundestag since 2009. In the Bundestag he serves as member of the Committee on Foreign Affairs and substitute member of the Defence Committee. Mr Kiesewetter is a former General Staff Officer of the Bundeswehr (Federal Armed Forces). Since November 2014 he is chairman of the CDU’s federal specialised committee on foreign, security, development and human rights policy. 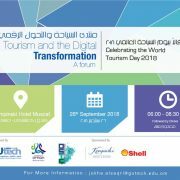 The Rectorate of GUtech welcomed the guests at the university. Prof. Dr. Ing. Michael Modigell introduced Mr Kiesewetter to the development of the university in the past eleven years, since its establishment. Prof. Dr. Heba Aziz, Head of the Department of Logistics, Tourism & Service Management, Faculty of Business and Economics, spoke about her department and the importance of tourism development according to the government’s vision to promote sustainable tourism. Prof. Heba Aziz also stressed on GUtech’s close cooperation with different German Universities of Applied Sciences in Stralsund and in Munich. Currently, around 60 % of the Non-GCC incoming tourists are German-speaking tourists. Oman will be the partner-country of the International Tourism Fair ITB 2020, which is held annually in Berlin (Germany). In addition, the parliamentarian and his accompanying delegation visited the GUtech EcoHaus. Mr Kiesewetter was briefed by Prof. Dr. Hind Barghash, Head of Environmental Engineering at GUtech and four female graduates of Environmental Engineering about the energy efficiency of the building. The students recently completed their BEng thesis on renewable energies. Mr Kiesewetter showed a strong interest in the student’s research and he asked them about possibilities for internships and start-ups in Environmental Engineering.